D'Addario Phosphor Bronze mandolin strings are the choice of many top bluegrass mandolin players. Genuine phosphor bronze alloy retains flexibility as well as brilliant tone for many hours of hard play. Computer-controlled wrapping around a hex core ensures consistency and extends life. 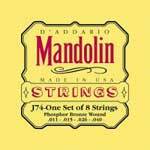 We recommend D'Addario mandolin strings to our customers and students.